Imagine living on a mining colony without proper radiation shielding, mega-corporations experimenting on sentient beings, or a post apocalyptic setting. Many science fiction universes are anchored on the existence of mutants. The Gravity Age: Mutant Menagerie will provide players and GMs with 1000’s of mutant options. It will also introduce a mutant building mechanic that stays true to the new Starfinder Roleplaying Game mechanics while attempting to maintain level appropriate balance. If you have enjoyed mutant themed RPGs in the past, this accessory is for you. As far as character building and monster creation I truly believe this will be one of our strangest publications to date. 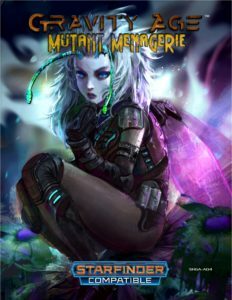 I expect to release Mutant Menagerie in the first half of November 2017. We are waiting on the Starfinder Alien Archive to confirm some of the graft mechanics, templates, and conditions.